For wildlife that live near oak trees, acorns are one of their most important food sources. And there's many to find this fall, as my friend Kathryn Kolb says, "It's a banner year for acorns." We took a walk on Saturday with our pups and found some really wonderful ones, all manner of pretty, fall colors. Above are some big and luscious chestnut oak acorns. The white oak acorns initiate their germination in the fall so they don't stick around for long- whereas you'll see the red oak acorns hang around a while, not germinating until the spring. 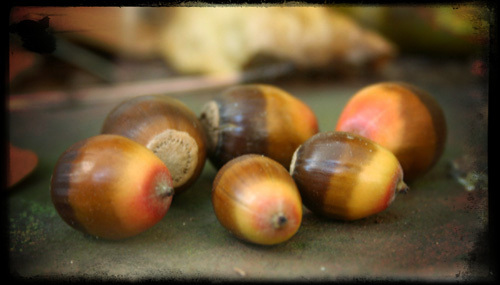 Deer (and people) prefer the white oak acorns as they are sweeter in flavor with less tannins than their red counterparts. But nature always has a plan as the red oak acorns contain 2-4x the fat content as the whites, which helps the animals of the forest get the sustenance they need to survive the chilly winter. These shiny and colorful acorns are chestnut oak. They start off green, turn red, yellow, brown, then dark...I love finding them for that short amount of time when they're one of everything. So pretty. This wonderful black and white photograph of southern red oak acorns is one of Kathryn's. She took this shot in even light on a late afternoon. She particularly likes how this one turned out, "I like that it's highly designed and completely not designed at the same time." See more of Kathryn's incredible work here.